"Hateful in the Eyes of God," by Eric Rutter, Alfred Hitchcock's Mystery Magazine, July/August 2018. This is a terrific story, full of historic detail, plot twists, and much to reflect on. It is London in the 1830s. John Alcorn is a freelance reporter, a "penny-a-liner." His specialty is the criminal courts because, then as now, scandal is always popular. He is in the gallery when Charles Stanbridge is brought into the courtroom. This fine, outstanding married gentleman has been accused of indecent assault, which is a reduced version of the charge of "the infamous crime," alias, homosexuality. That greater offense could get a man sentenced to exile or even death. Alcorn offers to sell his story on the case to the defendant, rather that to the press, a form of extortion which is perfectly legal. But when Stanbridge apparently kills himself the reporter feels guilt and tries to learn more about the case. And so he, and we, find out a good deal about the secret life of what we would call gay men, but what in this era were called sods or Mary Anns. As I said there are plot twists I never saw coming, but the whole story is fascinating. "The End of the World," by Susan Breen, in Malice Domestic Presents: Murder Most Geographical, edited by Verena Rose, Rita Owen, and Shawn Reilly Simmons, Wildside Press, 2018. When the story begins dear old Dad has just been convicted of murdering several young men in the basement. Cosima insists to the press that she had no idea what he was up to but, well, let's say she isn't out trying to prove him innocent either. She has enough money to start a new life which she does by heading to a resort in Tahiti.Very peaceful and beautiful, except the couple a few cottages down keeps arguing about money. Nothing unusual about that, except that the quarrels are about ten million dollars. And the quarrels are getting nasty. If another crime occurs, will Cosima be trying to explain she didn't know anything about this one too? A tricky tale that caught me by surprise. "Kyiv Heat," by Alex Shaw, in Noirville, Fahrenheit Press, 2018. Gennady Dudka is a top director of the Ukraine's Security Service. He is too set in his ways to cope with new technology. "Dudka's radio, like him, was old and refused to retire." Just before the Kyiv Day holiday he receives a disturbing package from as it turns out, an old friend who is a retired KGB agent. Dudka is under pressure to find out who set a bomb that killed a reporter. His friend's information suggests it was Ukrainian spies working for the Russians. But can the information be trusted or is someone being set up? And if so, who is the schemer and who is the potential victim? A neat little tale of the world in which the back of every cloak is targeted by a dagger. 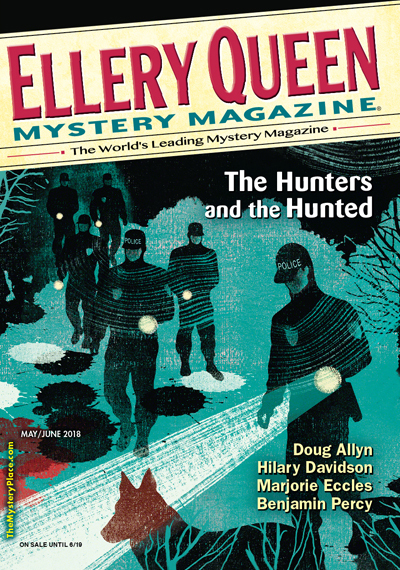 "Where the Strange Ones Go," by Steve Hockensmith, Ellery Queen Mystery Magazine, May/June 2018. This is Hockensmith's second appearance here. She quickly figures out that her main job is providing a layer of protection between her slime devil boss and his dissatisfied customers. But things have a way of turning around and the ending is full of clever twists.